He's back! 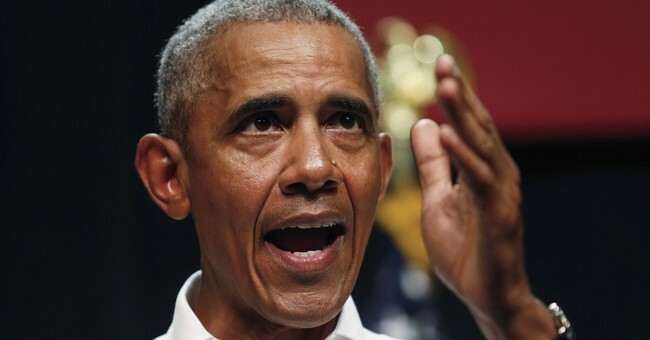 President Obama has emerged from his supposed cloistered life to attack President Trump. Obama broke with a tradition apparently only modern Republican ex-presidents follow, which is not to speak ill of your successor. Obama, who reportedly has been running his "Organizing for America" operation, along with his White House aide Valerie Jarrett from his expensive home in a Washington neighborhood, spoke to a group of University of Illinois students last Friday, claiming it was his policies, not those of President Trump, that have produced the current economic boom. "When you hear how great the economy's doing right now, let's just remember when this recovery started," Obama said. But during the Obama administration, the Gross Domestic Product never exceeded 3 percent annually. Obama said the days of strong economic growth were behind us, that many manufacturing jobs were lost and not returning and that candidate Trump didn't have a "magic wand" to fix the economy. But in the second quarter of this year, economic growth exceeded 4 percent and manufacturing jobs are making a comeback. By the time Obama left office, the unemployment rate had declined from a high approaching 8 percent at the start of his administration to just under 5 percent, but was beginning to tick back upward, according to the Bureau of Labor Statistics. In less than two years of the Trump administration, the nation has effectively gained full employment (3.9 percent unemployment rate) with minority unemployment reaching record lows. Obama should receive some credit for the way his administration helped the country after the 2007 recession, but not all the credit he now claims for himself. Hourly earnings, which were largely stagnant during the Obama years, have increased an average 2.9 percent over the last year. Obama's speech was part of a carefully coordinated strategy to win back a House majority for Democrats. This has included demonstrators at the hearings for Supreme Court nominee Brett Kavanaugh; the Bob Woodward book "Fear" and the daily and sometimes hourly torrent of anti-Trump invective from the major media, which see impeachment as their only hope of returning the establishment to power. Trump did himself a favor by not responding to Obama's speech in kind. Instead of taking to Twitter for a blistering attack, he joked that Obama's speech put him to sleep. The president did something last week I have long urged him to do. Statistics are dry. Show people who have jobs they couldn't find during the Obama years. In a speech in North Dakota, the president brought a man onstage who thanked him for his economic policies that allowed the man to go back to work. "'Many, many jobs were lost,' the coal miner said, 'and many towns were destroyed by this. It was just a horrible thing. Horrible suffering happened in this country. Really for made-up reasons, I think. And what your administration does -- has done -- is bringing us back to life.'" This is the way to counter the resistance. Keep showcasing people who were unemployed during the Obama years, but now have jobs. The president should then say if Democrats win a congressional majority they will stifle his successes and try to return to the failed policies of the past. That objective is what Obama meant in his speech. It is the opposite strategy, one that is working, that President Trump stressed in his. A show and tell approach can work against the tidal wave of opposition coming from the left. Flesh and blood are more powerful than ink and paper and TV news.